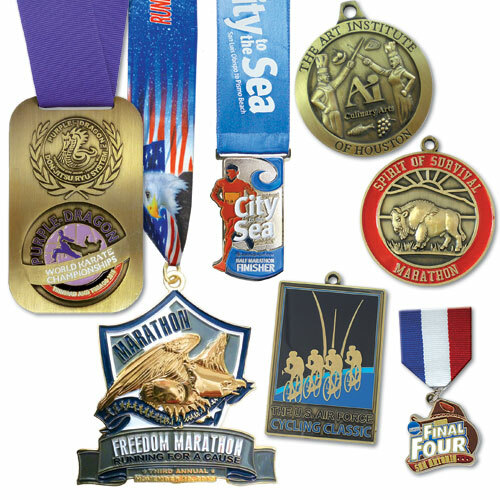 Custom-made medals, created in any shape you desire. Die Cast Medals can be made in vivid sculpted relief, in a variety of sizes, and in bright or antique finishes. Our artists are available to help you design your new medals. Bright Gold, Bright Silver, Bright Copper, Antique Brass, Antique Pewter, Antique Copper. Add 20% for Bright Gold. Colorfilling available for $0.20(V) per color, per side. Price includes a 1/8" (3mm) thick medal. For thicker medals, please increase the price by 10% per 0.5mm of extra thickness.